Summon: Unsummon another friendly creature to give Forsworn Guide +2/+2. 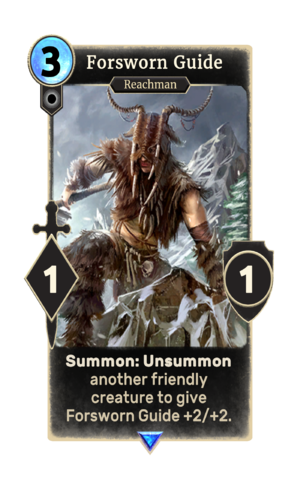 Forsworn Guide is a rare Neutral creature card. It is part of the Core Set. "I'll fight till my last breath!" This card's summon ability applies the Reachman Guidance card effect. The card is named for the Forsworn, a tribe of Reachmen active in the Fourth Era.